We have each performed at least 17,000 cataract and Lens Replacement procedures. 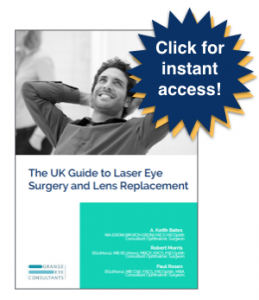 We are experts in the removal of the natural lens using the latest micro-incision phaco technology. We have been using foldable IOLs and multi-focal lenses for over two decades. When using a multi-focal lens, accurate measurement is crucial to select the right power for your eyes. We use the latest technology to measure all aspects of the eye. Doing so enables us to achieve the best visual outcome thereby eliminating or reducing your dependence on glasses: a realistic aim is for at least 80% of people having Lens Replacement not to use glasses for over 80% of the time, so they have very good ‘social vision’. Glasses may be required for reading small print or driving.